We are glad you found us and hope you will be too after your experience!! 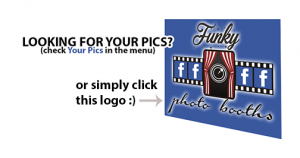 Funky Photobooths was established in 2014. It was a single mans venture who managed to build the business up and made it success. The business was then sold in 2017 to three young men who had the drive and ambition to try to double the size of the business in the first year and are putting those plans in action to make that vision a reality. We are based in Chislehurst, Bromley and Dartford. We cover a vast radius to supply you with our booth but depending on area may include a travel charge. We try to cater for everyone and everything including personal backgrounds on your photos if you so wish. We can also supply extras to make your night just that little bit more special such as Stanchions, Light up LOVE letters, Red carpet and Dancing Flames (please see our “extras” section). We also have an “other services menu” this shows you the people we are connected with such as Dj’s, Photographers, flower arrangers, sweet stalls etc. We have a vast up to date selection of props for you and your guests to choose from so you can decide if you want to be a rock star with a blow up guitar and funny wig or a Australian with a pirates parrot on your shoulder or why not have nothing and just have some lovely pictures taken with your family and friends?? We aim to make your experience the best it can be so contact us today and lets start planning what we need to do to give you that.